Below you can view all the homes for sale in the Shannon Woods subdivision located in Raleigh North Carolina. 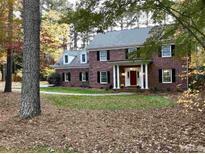 Listings in Shannon Woods are updated daily from data we receive from the Raleigh multiple listing service. To learn more about any of these homes or to receive custom notifications when a new property is listed for sale in Shannon Woods, give us a call at 919-928-5027. It’s hard to strike it rich in our current market, but the 650+ SF unfinished basement is an unexplored gold mine.© MLS#2248510. 511. Lovingly maintained with pride, this home boasts: gleaming hardwoods to compliment the stunning woodwork, a charming gazebo to compliment the elegance of the land, a "drop zone" room off of the garage not to be confused with the 2nd floor laundry. (Showing for back-up offers only). MLS#2240652. 4933. 800 sqft screen porch, flat lot with fenced in back yard, new kitchen with solid plywood cabinets, new appliances, granite countertops, spacious pantry, new bathrooms, new flooring, new can lights, new roof & windows, new gutters, and newly installed garage door round out the some of the features that make this home truly move in ready. All permitted. MLS#2224202. 4929.